The Emperor’s Harvest is a work of fantasy fiction, but at times characters say or pray words of wisdom and faith that are based on Bible verses. In my author’s notes at the back of the book, I set forth many of the historical and scientific realities that my fiction is based upon. I also direct readers to this website for biblical references. So here they are! And these are free of spoilers! Please let me know in the comments below, if you think I missed any. Baskrod’s prayer: If Adon had not been on our side, they would have drunk our blood. The flood would have engulfed us, the torrent would have swept over us and the raging waters would have carried us away. (Based on Psalm 124: 2-5). Amanki: “Adon hid his face.” (Based on Psalm 13:1). Moshoi’s father to Tuka: “May the gods give you the dew of heaven, the fatness of the earth and plenty of grain and wine.” (Based on Genesis 27:28, Isaac’s blessing to Jacob). Elder Lepton to Brina: “You must remember that you are called to rejoice, whatever your circumstances.” (Based on 1 Thessalonians 5:16-18, Nehemiah 8:10). Elder Lepton taught Brina: “You must remember that you are called to rejoice, whatever your circumstances.” (Based on 1 Thessalonians 5:16-18, Nehemiah 8:10). Most scientists think that the deaths were caused by the bubonic plague. Arriving in Europe from China, the Black Death killed off perhaps half of the medieval population in Europe. Imagine the terror of knowing the plague was coming to your village! A person would receive a letter from someone in infected areas to the south or east, and panic. Pilgrims who returned from trips reported seeing whole families drop dead within hours. Whole villages were wiped out. People in its path would not know what to do! They just knew they were next. Most of the doctors just ran away. People tried everything. They repented it droves and found creative ways of doing penance. Some would walk through the streets whipping themselves (flagellation). Others walked around carrying bunches of sweet smelling flowers. Still others changed their lifestyles and refused spices which came from the East. But nothing worked. The plague spread and killed. Artistic themes such as the dance macabre showed up in churches and other sites. In later outbreaks, during the 16th century, plague doctors sprang up. The doctor donned a mask with a long beak, and filled it with scented material such as rose hips and straw. He avoided breathing any of that “bad air” emanating from decaying matter that was believed to spread the plague. He also wore a long coat made of goat’s leather and covered with wax to protect him from the “miasma.” On his head he wore a traditional wide rimmed physician’s hat, to let people know he was a doctor. The outfit looks like it’s right out of a fantasy novel! People broke out with large blue buboes filled with a vile smelling pus. The plague doctor would lance the buboes or put leaches on them. When the patient died in spite of such treatment, it was the plague doctor’s duty to keep records, and perform an autopsy. Nostradamus was a plague doctor whose predictions became so popular that people are still reading them. Nostradamus told his patients to drink boiled water, sleep on clean sheets, and leave the area of infection. He invented the “rose pill” from rose hips, which we now know contained high levels of vitamin C.
Plague can be bubonic, septicemic, or pneumonic. Bubonic is spread by fleas from rats, Septicemic is spread through contact with the blood of those infected, and pneumonic is spread through the air. Bubonic victims suffered agony for days before coughing up blood and dying. Pneumotic victims died quickly, sometimes after just a few hours of contracting the disease. Some scientists believed that the plague of Athens in 430 B.C. was an early outbreak of Bubonic Plague, but Typhoid and Ebola are also possibilities. Thucydides described the symptoms as including an unquenchable thirst, a desire to be naked, and a preference to be submerged in cold water. The great statesman, Pericles, died during this outbreak. In Scene 1 of Act 5 in The Tempest, when the curtain is drawn, Miranda is seen playing chess against Ferdinand while they flirt. But the game of Chess lurks behind the entire plot. Prospero’s power was taken away when he was banished to the island. He spends his time plotting revenge on the king. Throughout the play, Prospero moves his people in to place, trying to corner King Alonso to win his Dukedom back. Check mate! 2. Pride and Prejudice by Jane Austen. Card games are featured throughout the book including: commerce, vingt-un, whist, loo, quadrille, and lottery. After dinner, at fancy parties on large estates, the cards are brought out. Commerce, lottery, and loo were round games, meaning there were no specific number of players. Vingt-un is similar to blackjack. The aristocrats passed their time playing card games since they could well afford to lose a little money at gambling. Near the beginning of the book, Elizabeth declines a game of loo saying she prefers books to games. But in truth, she enjoys card games, but can’t afford their high stakes. Later the aristocrats seem to have trouble interacting socially after dinner without card games. This showcases the differences between the aristocrats and the common people. 3. Edge by Jeffery Deaver. Jeffery Deaver utilizes board games in many of his books, including his series about a quadriplegic crime solver named Lincoln Rhyme, who is taught Go by some Chinese passengers on a ship. In the novel, Edge, the protagonist, Corte, collects tabletop games. As a “protector,” he goes head to head with a “lifter,” using game theory and explaining it as he goes. During the novel, Corte visits a game club in DC to play such classic games as Risk, Go, and Chess. 4. Harry Potter and the Philosopher’s Stone by J.K. Rowling. Hermione thinks wizard’s chess is barbaric. In the enchanted chess game, giant pieces move on command, often taking other pieces violently. But Ron Weasley, who has always been in the shadow of his brothers, turns out to be a terrific player. 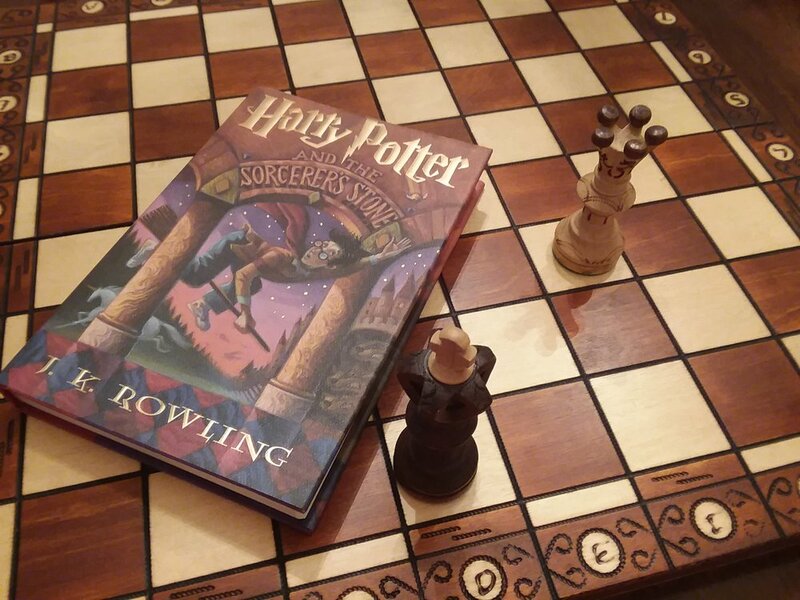 Commanding the giant chess pieces, Ron shows that he can think quickly, act strategically, and take charge. 5. One Flew Over the Cuckoo’s Nest by Ken Kesey. McMurphy, who likes to gamble, talks the other patients into using real money when playing monopoly, with a real penny representing a monopoly dollar. One game goes on for three days. McMurphy convinces the others to take more risks in life as well as in Monopoly. 6. 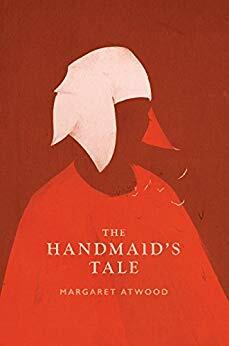 The Handmaid’s Tale by Margaret Atwood. The female protagonist, Offred, is chosen as a breeder, useful only for having babies. When the Commander invites her to play Scrabble in the forbidden room, she feels more like a person again. She spells valence, quince, zygote, limp, and crisp. 7. 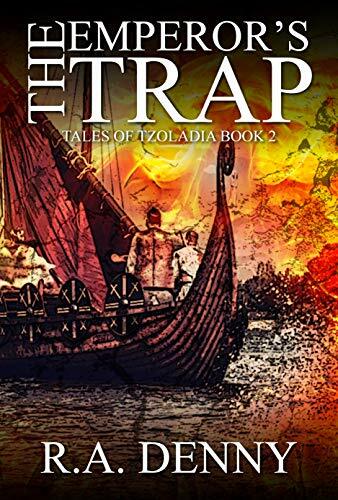 The Emperor’s Trap by R.A. Denny. Outside the Gates of the Underworld, the soldiers gamble while playing the board game Mud, Rocks, and Trees. They play to win money, but also to predict player’s fortunes, much like the Royal Game of Ur. Colonel Pilizer takes a special interest in young Tuka’s skill at play, and bets against one of his own veteran soldiers, adding fuel to the soldier’s jealous anger. In the Tzoladian war camp, Colonel Fineas wins a pile of tzfards from other officers by playing the part of mud in the dice and race strategy game. As long as his winning streak and the beer last, he becomes more amenable toward the soldiers from the mud regions of the empire, giving them a spark of hope. But will it last? 8. 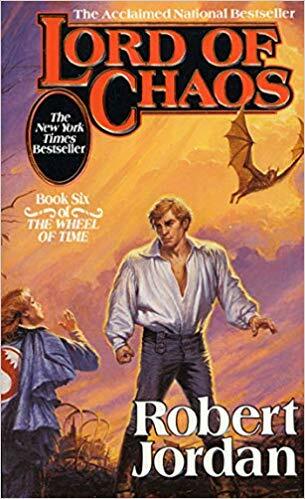 Lord of Chaos by Robert Jordan. Sha’rah, Stones, and Snakes and Foxes are games played in The Wheel of Time series. According to Robert Jordan, Stones is very similar to the game Go. 9. 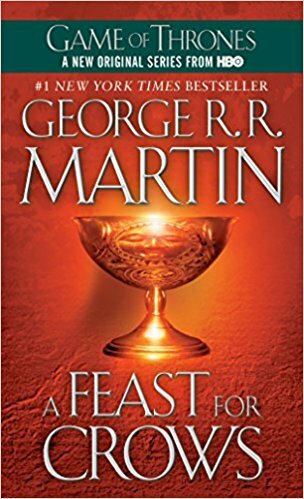 A Feast for Crows by George R.R. Martin. The Dornish Court is enamored with the game of Cyvasse which arrived on a galley from Volantis. Princes Myrcella Baratheon learns the game from her bethrothed, Prince Trystane Martell and beats him more often than not. Dorian tries to use the game to teach his daughter Arianne to study a game before trying to play it. Tyrion Lannister plays Cyvasse on his voyage on the Shy Maid with young Griff, and by winning learns the boy’s true identity. When Tyrion is sold as a slave, he brags about his Cyvasse skills. In The Winds of Winter, after a skirmish, the white dragon piece ends up at Tyrion’s feet, but blood stains make it look like it has veins of blood. According to George R.R. Martin, Cyvasse is partially inspired by Chess, Blitzkrieg, and Stratego. A fan has created a copy with rules. 10. The Wise Man’s Fear by Patrick Rothfuss. 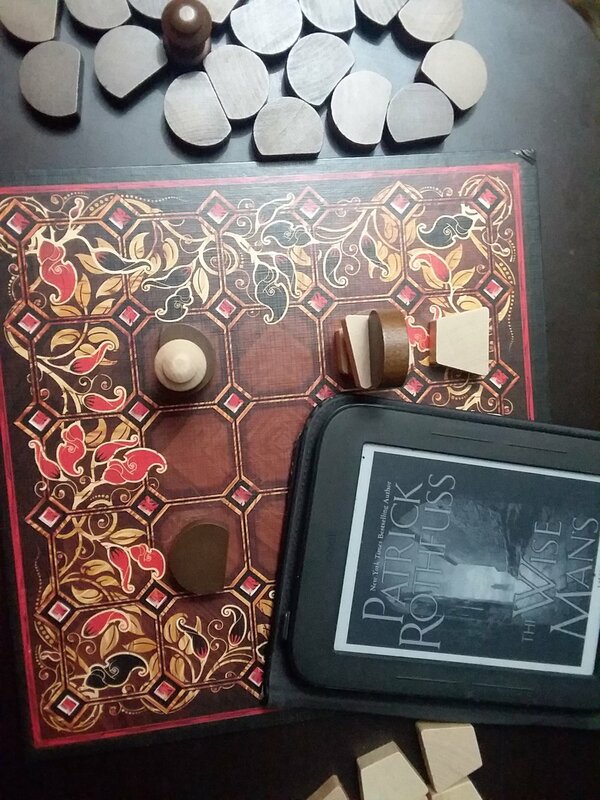 Tak, Pairs, and Corners are games played in The Kingkiller Chronicle. Tak is a game of abstract strategy and logic played in The Wise Man’s Fear. Kvothe describes the rules as simple, but the strategy complex. In the land of Vintas, Bredon, a noble in the court, befriends Kvothe and introduces the game to him. He claims the point is not to win but to play a beautiful game. Later, Felurion of the fae plays a lovely game of Tak with Kvothe. Actual Tak and Pairs games have been created and are available online. What novels would you add to this list? I’d love to hear from you in the comments below! Today would have been my father’s 93rd birthday, but recently he went to be with the Lord. In the days following his death, I wrote this poem. I would write a little, then cry a little, and then write some more. It’s not formal, but it is from the heart! I’m posting it today, on his birthday, to honor him. I feel so blessed to have had such a wonderful Dad. An only child, his cousins were like the brothers he never knew. Where flat fields stretch to meet the sky, and things aren’t good but great. After school they’d go hunting or out in the lake to fish. Who had learned to grow fruits and vines in a land with little rain. But the secret to make the fish bite was to hold your mouth just so. When he looked back at the height of the fence, he knew it was a miracle. He was the county ping pong champ, (a talent that he proved can last). He taught me you can do anything, if only you just try. Then his country called him to duty, and he saw things he’d never seen. He chose the Navy because he wanted to be on a boat, not a tank or plane. When they drew the line on the list, his name was just below. When the bomb was dropped, it ended the war, and so it saved his fate. He taught me you can do anything, if you only just believe. He never dreamed the opportunities that this decision would yield. To do research in a lab on canning and food technology. Planned to stay for a year or so, but that all changed when into love he fell. With over 40 technical publications that you can read online. It was my Dad’s research that made that advancement come to pass. He was a man who was loyal, there was never a task he would shirk. He taught me to be faithful, to the tasks that I am given, in whatever places that I go. When I wanted a snow or tree fort, my Dad drew up a plan. Detective stories, with Pegleg Pete and tales of skull and bones. I’d put my feet on his feet and he’d waltz me around the room. He’d send a ball to rootville, to win that’s how you play. He taught me to love nature and all of its mysteries. We’d compete to draw the one that would give the greatest fright. He always had an encouraging word, he was such positive man. So whatever I faced, I wasn’t alone, he was right there for the ride. He still played games and taught them things, he knew just what to do. And when he wasn’t with us, for each one of us he’d pray. He had a can-do spirit. His mind was sharp, and his heart was made of gold. For He taught me to have a grateful heart for all the simple things. He was happy walking by quiet streams and fishing with a rod. “I’m not one for spilled milk,” is all that he would say. But I watched him turn the other cheek, even on a bad day. My father was a gentleman, kind and patient and true. “You take what the Lord gives you,” was his faithful reply. So many people his spirit has touched, we’ll never know all their names. For his sweet and loving spirit he was universally adored. Never judging me but only loving me, whether I was an adult, a child, or a teen. For a life of faithfulness, my Dad now dwells in the house of the Lord. He was the best friend and father that anyone could ever have had. His love is all around me, even now that he has died. No matter how many years he had lived, it would be too soon, too soon to say goodbye. Welcome to my author’s website! If you’re reading this, I’m guessing you’re curious about my books, or maybe you’re already a fan. I started writing novels after watching the movie, The Hobbit, An Unexpected Journey (how fitting…) when one of my sons issued a creative challenge. But I already knew that I loved to write stories. Actually, I love to do anything creative whether it’s painting, writing, or inventing tabletop games. I can’t begin to tell you how big my smile is every time a stranger from out there reviews my books or contacts me, and I find out how much they enjoy stepping into the worlds I have created. It is so much fun! I think in heaven people probably spend time journeying with each other to discover new and fascinating worlds beyond our current limited imaginations. After all, God loves variety. Just look at all the amazing things He created right here on earth!